By Peter A. Quinter, Esq. ﻿﻿﻿﻿﻿﻿﻿At our Export Compliance Bootcamp, the 75 participants were treated to an informative presentation by Special Agent Jonathan Barnes, from the Miami Field Office of the Office of Export Enforcement for the Bureau of Industry and Security (BIS), U.S. Department of Commerce, and Peter Quinter, Chair, Customs and International Trade Law Group at GrayRobinson. When going into more detail on each of these subjects, Special Agent Barnes spent a lot of time talking about Category #3 - Human Error. He strongly urged all exporters present at the Bootcamp to take the time to create an Export Management and Compliance Program (EMCP). Although having a Written Compliance Program in place is not required of all exporters, it is an enormously effective tool to help an exporter manage its export transactions, detect human errors, and is a factor in mitigating any potential penalty assessed by BIS for a violation. Special Agent Barnes also stressed the importance of correctly creating and implementing an EMCP. He explained that many times exporters attempt to create these EMCPs on their own and end up creating more problems for themselves by doing it incorrectly or incompletely. Special Agent Barnes urged the participants to work together with BIS as well as with a customs and trade attorney to effectively design an EMCP. In our experience, when BIS sees that an exporter has taken seriously the responsibility of correctly drafting and implementing an EMCP (including working with professionals to ensure compliance with Federal Regulations), BIS Agents and attorneys in the BIS Office of Chief Counsel will look upon the exporter much more favorably when reducing the penalty. So what is an EMCP? An EMCP takes individual decisions and pieces of information and builds them into an organized, integrated system. It is a program which can be established to manage export-related decisions and transactions to ensure compliance with the Export Administration Regulations (EAR) and license conditions. Why is having an EMCP so important? 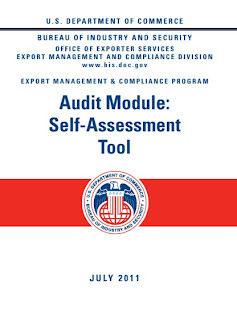 While the EAR allows flexibility in the manner in which U.S. companies meet these compliance requirements in a number of different methods, BIS strongly recommends that all parties dealing with export transactions maintain a vigorous and effective Export Management and Compliance Program (EMCP), incorporating the nine key elements (listed below and also available here), and especially the screening of all parties to transactions, as part of their overall due diligence. Compliance activities would differ depending on the nature of the items being exported and the destinations to which they are exported, but err on the side of caution to ensure that our U.S.-origin dual-use goods and technologies are exported in compliance with the EAR. So what are the Core Elements of an Effective EMCP? Management Commitment: Senior management must establish written export compliance standards for the organization, commit sufficient resources for the export compliance program, and ensure appropriate senior organizational official(s) are designated with the overall responsibility for the export compliance program to ensure adherence to export control laws and regulations. Train staff on red flags! Know Your Customer Guidance - Dealing with "Red Flags"
Formal Written Export Management and Compliance Program: Effective implementation and adherence to written policies and operational procedures. Cradle to Grave Export Compliance Security: Screening of employees, contractors, customers, products, and transactions and implementation of compliance safeguards throughout the export life cycle including product development, jurisdiction, classification, sales, license decisions, supply chain, servicing channels, and post-shipment activity. So what are the next steps? How can an exporter create an appropriate and effective EMCP? First step is to audit your own exporting processes and see how you are currently doing in comparison to requisite EMCP provisions. 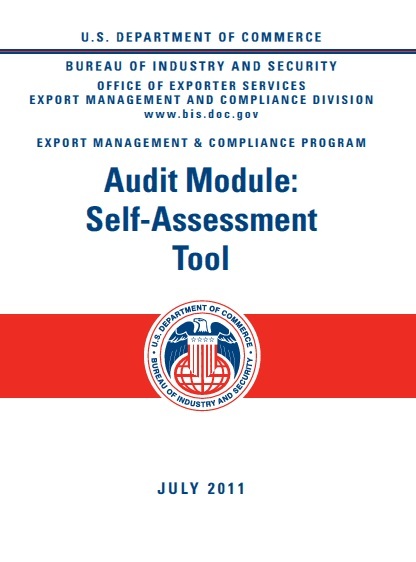 You can download BIS's EMCP Audit Module: Self-Assessment Tool here. 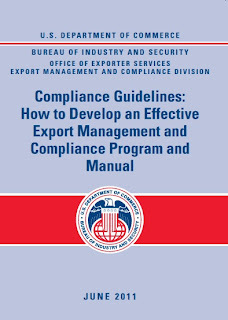 Next, an Exporter should print out and thoroughly read through the BIS Compliance Guidelines: How to Develop an Effective Export Management and Compliance Program and Manual. This official BIS 166 page document provides an exporter with a strict and specific set of guidelines for establishing an EMCP effectively. The next step is to contact an experienced and knowledgeable export compliance attorney to draft and assist in the implementation of the EMCP, including training of affected employees in the logistics, compliance, or export departments of the company. Once you are done with the audit and reading through the EMCP Guidelines, the exporting company should make a commitment to drafting its own Export Management and Compliance Program and Manual and then implementing it. Remember - having an EMCP is multi-faceted.... you are putting your procedures in writing, pursuant to the Federal Regulations, and then you must actually abide by those procedures for every single export transaction or potential export transaction that you may come across. Companies should not be afraid to ask for help from BIS directly, skilled and experienced consultants, or Customs and International Trade Attorneys. BIS has made it clear that establishing and implementing an effective EMCP is key for all exporters and this responsibility should not be taken lightly. For questions on creating your own EMCP, please do not hesitate to reach out. The purpose connected with freight broker agent training in addition to freight negotiator are virtually the identical. The majority of the profitable agents begun while agents. Normally the one that get in touch with shippers to get the fill will be the freight staker agents.